What Tools are required ? Are all cold asphalts made equal? Yes, the polymers in the coldmix will expel the water. We have contractors who use our product in all sorts of weather conditions. How long will the product last in the bag? A year, we have tested product that has been stored for over a year and it works just fine. Is it available anywhere in NZ ? Yes you can purchase Bitumend coldmix from Placemakers, Highway1, Traffic R Us or if you are ordering in bulk from Highroads. Should I clean all the debris out of the pohole before filling? Yes, you are best to brush out all the loose debris and stones. This will help the coldmix bind against something solid. If the hole is very shallow it is best to create an edge around the hole for the coldmix to bind against. 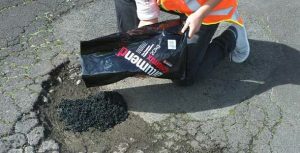 It will depend on the depth of the hole but a bag of bitumend coldmix should fill a pothole that is around 50cm2.